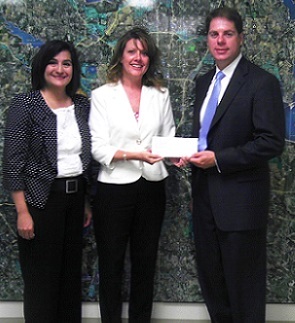 L-R: Tammie Marceleño (Vice President, Chase Global Philanthropy); Donna Van Ness (President, TCHP); Todd Ritterbusch (CEO, Chase Tarrant County). JP Morgan Chase has awarded Tarrant County Housing Partnership a grant of $25,000 to support the organization's homebuyer education and homeowner counseling programs. TCHP's education program is designed to help community members learn what it takes to buy and maintain a home, and to help homeowners in crisis avoid foreclosure. "Chase is a longtime supporter of the TCHP mission to improve access to affordable housing in our community," said Donna Van Ness, TCHP's president. and economic opportunity," she added. Learn more about Chase's corporate philanthropy.